Lock in a great price for Hotel The Originals Royan Foncillon (ex Inter-Hotel) – rated 8.5 by recent guests! The young lady and the Austalian? were a great help ,friendly and competent . Check out lady, Valerie could improve. Overall it's a very good and clean hotel with an excellent mattress. Staff was always polite and helpful. Great view of the beach and city. Excellent service from all the staff. Room overlooking the port was very comfortable and quiet. Plenty of choice at breakfast. Fantastic staff! Always kind and welcoming! Special thanks to personnel working on June 23, 2018 when there was cancelled train from Royan to Bordeaux to where we got train tickets bought in advance. No car rent was available as well on that day. Both women were so kind and helpful and we found a solution how to get to Bordeaux and manage to our plain next day early morning. Thanks a lot to them! Perfect location right across the road from the Conche de Foncillon. Lovely coastal walk past the old fishing huts. Excellent breakfast in the hotel with lots of local products. Small, but well equipped and very clean (economy) room. My husband walked with a lot of pain, we could park in front of the hotel and when a taxi refused to take us because of my dog, the owner drove us himself. This is real service!! Great location Close to the great central market Super parking but get there either early or after 10 Ferry to gironde west bank across the road.. Bed was lovely and comfortable and the sea view was amazing. They were most helpful as we were travelling with a dog, and also recommended a superb restaurant to eat in. Breakfast was great. 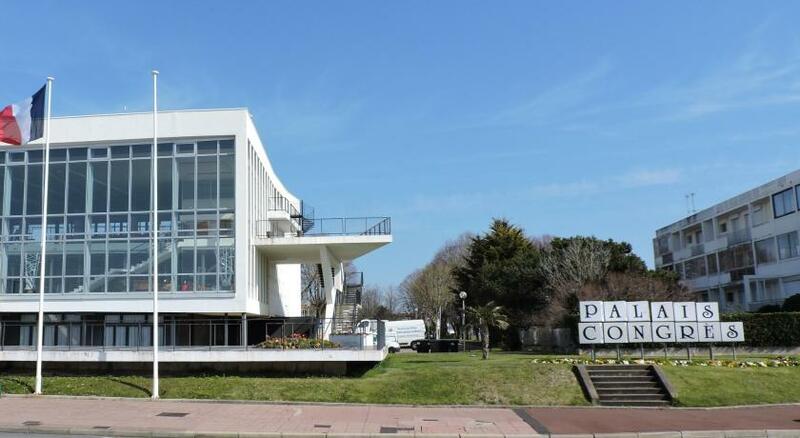 One of our top picks in Royan.Located on Royan Bay and 11 mi from La Palmyre Zoo, Hotel The Originals Royan Foncillon is just 650 feet from the port and ferries, and 5 minutes' walk from the town center. The rooms come with free WiFi, tea/coffee making facilities and a flat-screen TV. All rooms have air conditioning. A sweet and savory buffet breakfast can be served in the dining room or in your bedroom. Guests are invited to enjoy a drink in the Foncillon’s bar. There is a free public car park a few steps from the hotel. 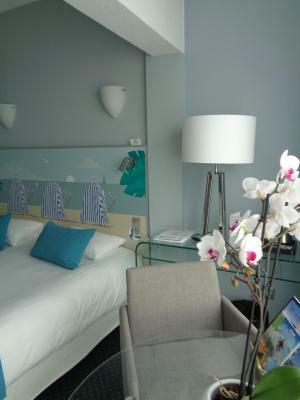 When would you like to stay at Hotel The Originals Royan Foncillon (ex Inter-Hotel)? Rooms are 17 square yards and have tea/coffee making facilities. This twin room features tea/coffee making facilities. This room offers 1 double bed and tea/coffee making facilities. Upon prior request, this room can accommodate a baby cot. This air-conditioned room has a terrace and sea views, as well as tea/coffee making facilities.. The bathroom has a bath and hairdryer. Other facilities include a desk, phone, flat-screen TV and free WiFi. This quadruple air-conditioned room has a terrace and sea views, as well as tea/coffee making facilities. This double room has a flat-screen TV, shower, toilet and courtesy tray. House Rules Hotel The Originals Royan Foncillon (ex Inter-Hotel) takes special requests – add in the next step! Hotel The Originals Royan Foncillon (ex Inter-Hotel) accepts these cards and reserves the right to temporarily hold an amount prior to arrival. Guests wishing to use their own babycot are kindly requested to contact the hotel in advance. Only the Superior Double Room with Sea View can accommodate one. Contact details can be found on the booking confirmation. I got locked in my bedroom the day before last (key wouldn't turn anymore). The housekeeper came to open and I was able to exit very quickly. The owner worked on the lock later on and it got easier. However, it gave me anxiety as I had another night to spend there and was thinking about a possible fire. Nothing but praise for the hotel, but in the height of summer parking near the hotel could be a problem as the town gets very busy. However all parking on Royan is free. Rooms a bit too small and all so compact, but that may be my feeling as I am used to larger rooms. Since the purpose was not to spend time in hotel room but have walk around tours and sun-bathing, it is fine with the room size. All clean and fresh.